So I've been bitten by the lock-free bug! After finishing my single-producer, single-consumer lock-free queue, I decided to design and implement a more general multi-producer, multi-consumer queue and see how it stacked up against existing lock-free C++ queues. After over a year of spare-time development and testing, it's finally time for a public release. TL;DR: You can grab the C++11 implementation from GitHub (or jump to the benchmarks). The way the queue works is interesting, I think, so that's what this blog post is about. A much more detailed and complete (but also more dry) description is available in a sister blog post, by the way. At first glance, a general purpose lock-free queue seems fairly easy to implement. It isn't. The root of the problem is that the same variables necessarily need to be shared with several threads. For example, take a common linked-list based approach: At a minimum, the head and tail of the list need to be shared, because consumers all need to be able to read and update the head, and the producers all need to be able to update the tail. This doesn't sound too bad so far, but the real problems arise when a thread needs to update more than one variable to keep the queue in a consistent state -- atomicity is only ensured for single variables, and atomicity for compound variables (structs) is almost certainly going to result in a sort of lock (on most platforms, depending on the size of the variable). For example, what if a consumer read the last item from the queue and updated only the head? The tail should not still point to it, because the object will soon be freed! But the consumer could be interrupted by the OS and suspended for a few milliseconds before it updates the tail, and during that time the tail could be updated by another thread, and then it becomes too late for the first thread to set it to null. The solutions to this fundamental problem of shared data are the crux of lock-free programming. Often the best way is to conceive of an algorithm that doesn't need to update multiple variables to maintain consistency in the first place, or one where incremental updates still leave the data structure in a consistent state. Various tricks can be used, such as never freeing memory once allocated (this helps with reads from threads that aren't up to date), storing extra state in the last two bits of a pointer (this works with 4-byte aligned pointers), and reference counting pointers. But tricks like these only go so far; the real effort goes into developing the algorithms themselves. The less threads fight over the same data, the better. So, instead of using a single data structure that linearizes all operations, a set of sub-queues is used instead -- one for each producer thread. This means that different threads can enqueue items completely in parallel, independently of each other. Of course, this also makes dequeueing slightly more complicated: Now we have to check every sub-queue for items when dequeuing. Interestingly, it turns out that the order that elements are pulled from the sub-queues really doesn't matter. All elements from a given producer thread will necessarily still be seen in that same order relative to each other when dequeued (since the sub-queue preserves that order), albeit with elements from other sub-queues possibly interleaved. Interleaving elements is OK because even in a traditional single-queue model, the order that elements get put in from from different producer threads is non-deterministic anyway (because there's a race condition between the different producers). [Edit: This is only true if the producers are independent, which isn't necessarily the case. See the comments.] The only downside to this approach is that if the queue is empty, every single sub-queue has to be checked in order to determine this (also, by the time one sub-queue is checked, a previously empty one could have become non-empty -- but in practice this doesn't cause problems). However, in the non-empty case, there is much less contention overall because sub-queues can be "paired up" with consumers. This reduces data sharing to the near-optimal level (where every consumer is matched with exactly one producer), without losing the ability to handle the general case. This pairing is done using a heuristic that takes into account the last sub-queue a producer successfully pulled from (essentially, it gives consumers an affinity). Of course, in order to do this pairing, some state has to be maintained between calls to dequeue -- this is done using consumer-specific "tokens" that the user is in charge of allocating. Note that tokens are completely optional -- the queue merely reverts to searching every sub-queue for an element without one, which is correct, just slightly slower when many threads are involved. So, that's the high-level design. What about the core algorithm used within each sub-queue? Well, instead of being based on a linked-list of nodes (which implies constantly allocating and freeing or re-using elements, and typically relies on a compare-and-swap loop which can be slow under heavy contention), I based my queue on an array model. Instead of linking individual elements, I have a "block" of several elements. The logical head and tail indices of the queue are represented using atomically-incremented integers. Between these logical indices and the blocks lies a scheme for mapping each index to its block and sub-index within that block. An enqueue operation simply increments the tail (remember that there's only one producer thread for each sub-queue). A dequeue operation increments the head if it sees that the head is less than the tail, and then it checks to see if it accidentally incremented the head past the tail (this can happen under contention -- there's multiple consumer threads per sub-queue). If it did over-increment the head, a correction counter is incremented (making the queue eventually consistent), and if not, it goes ahead and increments another integer which gives it the actual final logical index. The increment of this final index always yields a valid index in the actual queue, regardless of what other threads are doing or have done; this works because the final index is only ever incremented when there's guaranteed to be at least one element to dequeue (which was checked when the first index was incremented). Since I thought there was rather a lack of high-quality lock-free queues for C++, I wrote one using this design I came up with. (While there are others, notably the ones in Boost and Intel's TBB, mine has more features, such as having no restrictions on the element type, and is faster to boot.) You can find it over at GitHub. It's all contained in a single header, and available under the simplified BSD license. Just drop it in your project and enjoy! So, the fun part of creating data structures is writing synthetic benchmarks and seeing how fast yours is versus other existing ones. 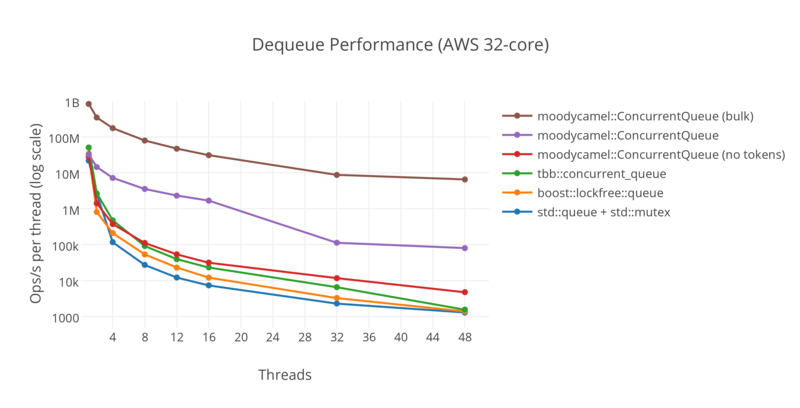 For comparison, I used the Boost 1.55 lock-free queue, Intel's TBB 4.3 concurrent_queue, another linked-list based lock-free queue of my own (a naïve design for reference), a lock-based queue using std::mutex, and a normal std::queue (for reference against a regular data structure that's accessed purely from one thread). 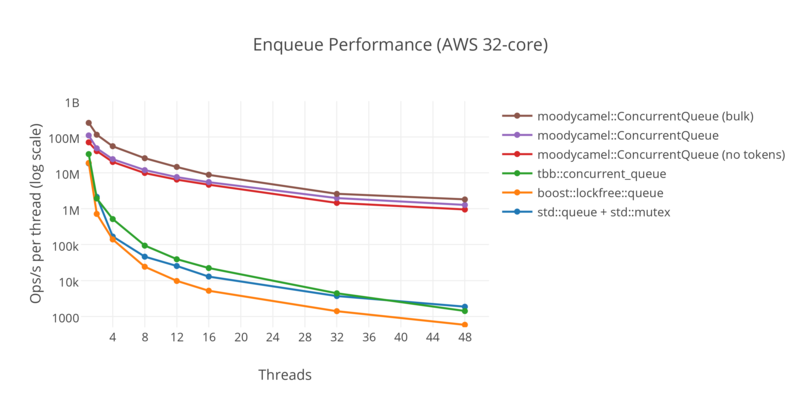 Note that the graphs below only show a subset of the results, and omit both the naïve lock-free and single-threaded std::queue implementations. Here are the results! Detailed raw data follows the pretty graphs (note that I had to use a logarithmic scale due to the enormous differences in absolute throughput). Note that these are synthetic benchmarks. Take them with a grain of salt. Operations include those that fail (e.g. because the queue is empty). Each logical enqueue/dequeue counts as an individual operation when in bulk. As you can see, my queue is generally at least as good as the next fastest implementation, and often much faster (especially the bulk operations, which are in a league of their own!). 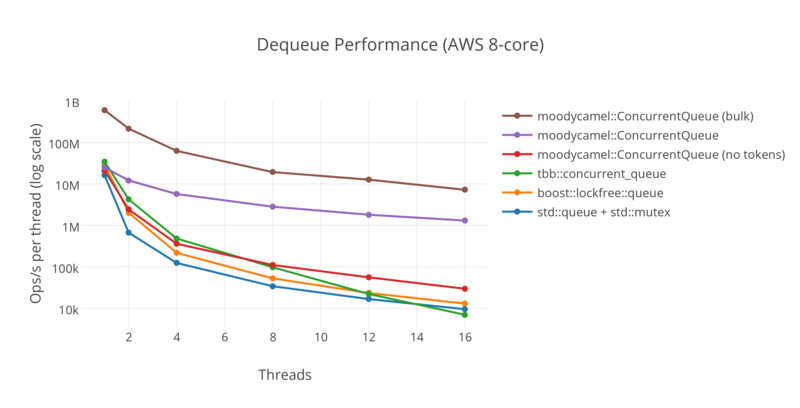 The only benchmark that shows a significant reduction in throughput with respect to the other queues is the 'dequeue from empty' one, which is the worst case dequeue scenario for my implementation because it has to check all the inner queues; it's still faster on average than a successful dequeue operation, though. The impact of this can also be seen in certain other benchmarks, such as the single-producer multi-consumer one, where most of the dequeue operations fail (because the producer can't keep up with demand), and the relative throughput of my queue compared to the others suffers slightly as a result. Also note that the LockBasedQueue is extremely slow on my Windows netbook; I think this is a quality-of-implementation issue with the MinGW std::mutex, which does not use Windows's efficient CRITICAL_SECTION and seems to suffer terribly as a result. 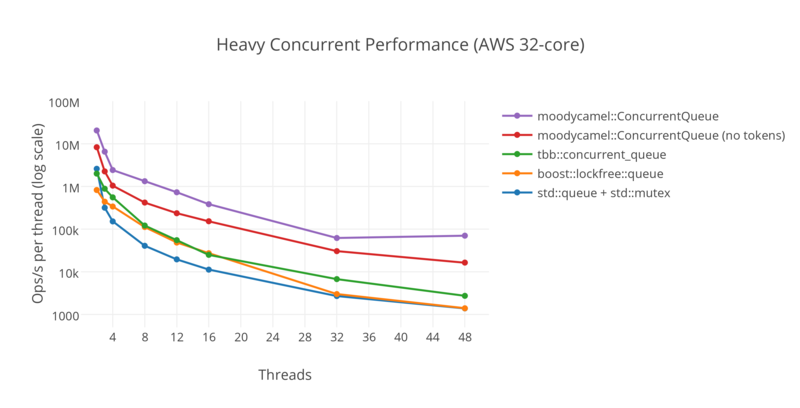 I think the most important thing that can be gleaned from these benchmarks is that the total system throughput at best stays roughly constant as the number of threads increases (and often falls off anyway). 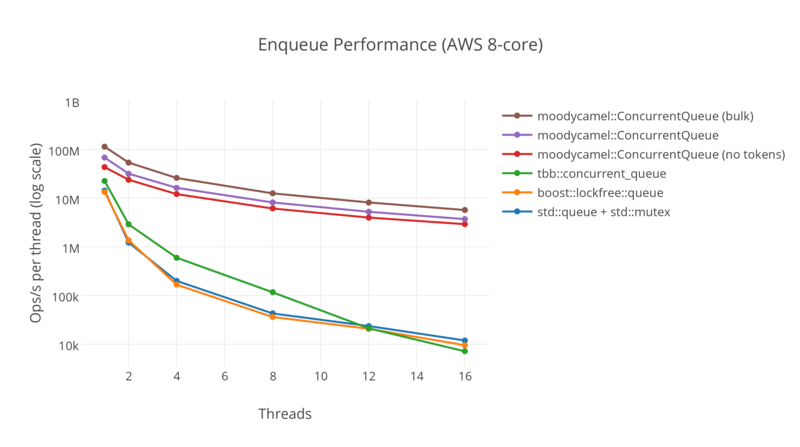 This means that even with the fastest queue of each benchmark, the amount of work each thread accomplishes individually declines with each thread added, with approximately the same total amount of work being accomplished by e.g. four threads and sixteen. And that's the best case. 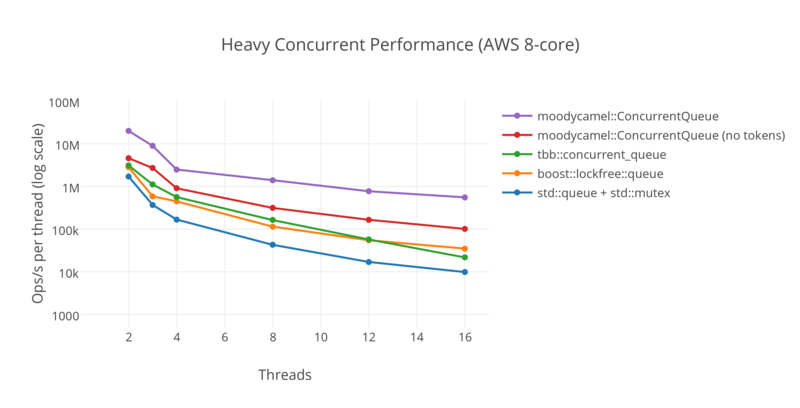 There is no linear scaling at this level of contention and throughput; the moral of the story is to stay away from designs that require intensively sharing data if you care about performance. Of course, real applications tend not to be purely moving things around in queues, and thus have far lower contention and do have the possibility of scaling upwards (at least a little) as threads are added. On the whole, I'm very happy with the results. Enjoy the queue!